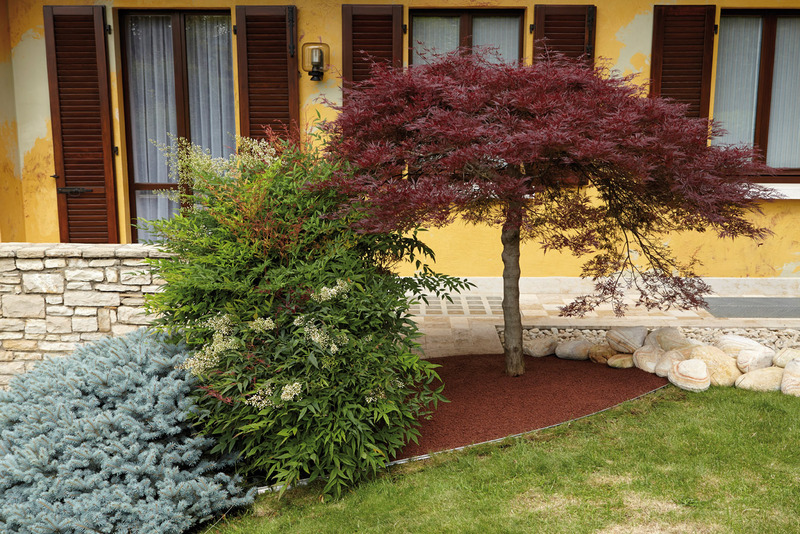 Alubord is the edging of Granulati Zandobbio that allows to delimit pavings and flower beds, allowing to clearly separate any decoration made with gravel, pebbles or stone chippings; it is the ideal garden border for DIY enthusiasts but also dedicated to the most demanding professionals. Available in aluminum, corten or plastic in many sizes and models. 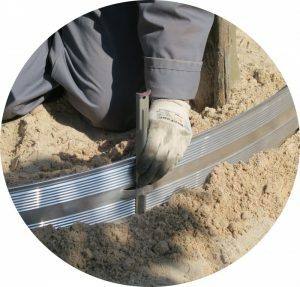 It is particularly suitable for use as containing edging for creating paths using gravel, interlocking paving, resin surfacing or other filler materials. It provides high resistance to foot traffic, ensuring the flooring is held solidly. 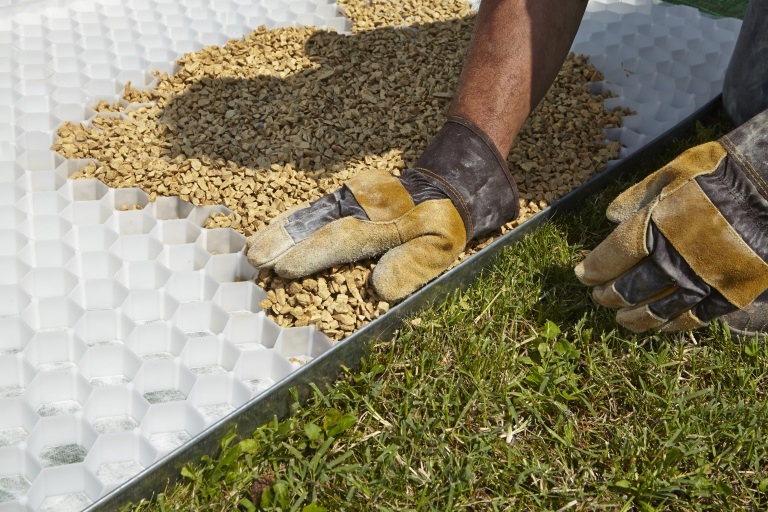 Its simple installation method makes it quick to install and therefore highly economical as labour costs for installation and future maintenance are significantly reduced. The aesthetic features of the edging profile certainly make it one of the most interesting solutions from a design point of view, while maintaining a superior level of mechanical strength in comparison with alternative products. ALUBORD can be used in combination with natural PAMIDRE mulch to border the beds and create a layer of inert material that prevents the growth of weeds. 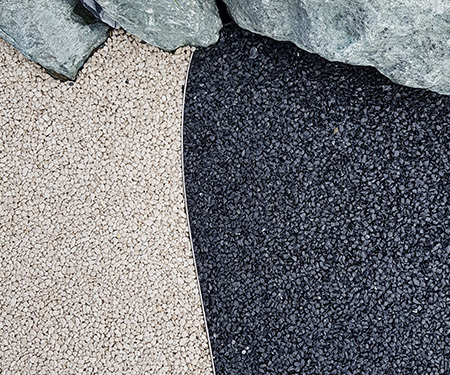 Using ALUBORD in combination with GRAVELFIX is also recommended for creating stable paving or for enclosing gravel avenues. It can be laid quickly and does not require the use of special equipment. ✔ ALUBORD IA: available in 14 cm height, self-fitting without junctions and fitted with slots to be picked up on the ground by the picket available in the catalog. ✔ ALUBORD I: available in 10 cm and 20 cm heights, self-fittingwithout the use of junctions. 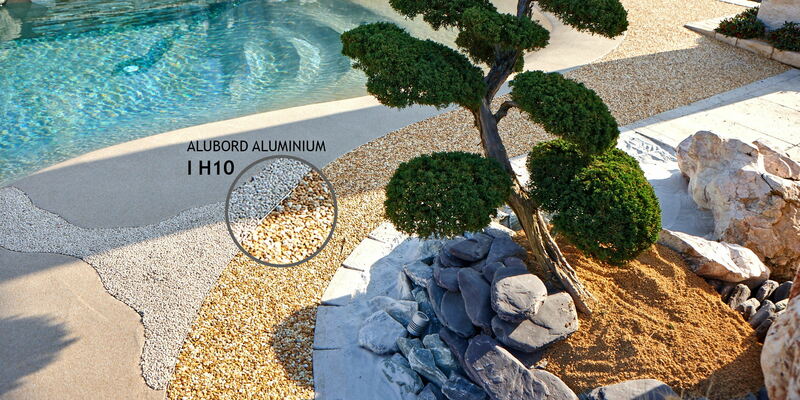 ✔ ALUBORD L: 5 cm high, ideal for delimiting GRAVELFIX. ✔ ALUBORD CORTEN I: available in 14 cm height. ✔ ALUBORD CORTEN L: 5 cm hight, ideal for delimiting GRAVELFIX. ✔ ALUBORD PLASTIC I: available in 10 cm height, self-fitting without the use of junctions. 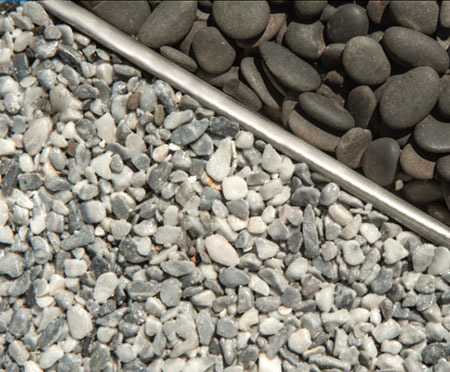 The stone on sight drainage paving is the perfect product for the poolsides and for the outdoor places. For this type of works marble pebbles and Alubord edgings are used. Thanks to its flexibility Alubord allows the creation of simple geometric designs, guaranteeing a clearer separation of the used materials.